"This makes CSE a promising target for tailoring a wide range of biomass feedstocks for a bio-based economy. Adoption of biofuels as a viable alternative to fossil fuels has been limited due to the conflicting pressures of using food sources for fuel, but that situation could be transformed thanks to the discovery of a gene in the biosynthetic pathway of lignin. Lignin is a major component of plant secondary cell walls that limits the conversion of biomass to energy and the breakthrough, reported this week in Science Express, paves the way for new initiatives supporting a biofuel-based economy. To understand how plant cells can deliver fuel or plastics, a basic knowledge of a plant’s cell wall is needed. 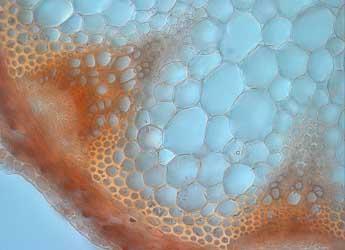 A plant cell wall mainly consists of lignin and sugar molecules such as cellulose. Cellulose can be converted to glucose which can then be used in a classical fermentation process to produce alcohol, similar to beer or wine making. Lignin is a kind of cement that embeds the sugar molecules and thereby gives firmness to plants. Thanks to lignin, even very tall plants can maintain their upright stature. Unfortunately, lignin severely reduces the accessibility of sugar molecules for biofuel production. The lignin cement has to be removed via an energy-consuming and environmentally unfriendly process. Plants with a lower amount of lignin or with lignin that is easier to break down can be a real benefit for biofuel and bioplastics production. The same holds true for the paper industry that uses the cellulose fibres to produce paper. Using the model plant Arabidopsis thaliana, researchers from the James Hutton Institute, the University of Dundee, VIB and Ghent University (Belgium) and the University of Wisconsin (USA) have identified a new enzyme caffeoyl shikimate esterase (CSE). This enzyme fulfils a central role in lignin biosynthesis; knocking-out the CSE gene resulted in 36% less lignin per gram of stem material. Additionally, the remaining lignin had an altered structure. As a result, the direct conversion of cellulose to glucose from un-pretreated plant biomass increased four-fold, from 18% in the control plants to 78% in the CSE mutant plants. These new insights can now be used to screen natural populations of energy crops such as poplar, eucalyptus, switchgrass or other grass species for a non-functional CSE gene. Alternatively, the expression of CSE can be genetically engineered in energy crops. A reduced amount of lignin or an adapted lignin structure can contribute to a more efficient conversion of biomass to energy. The research was co-financed by the multidisciplinary research partnership ‘Biotechnology for a sustainable economy’ of Ghent University, the DOE Great Lakes Bioenergy Research Center and the ‘Global Climate and Energy Project’ (GCEP). Based at Stanford University, the Global Climate and Energy Project is a worldwide collaboration of premier research institutions and private industry that supports research on technologies that significantly reduce emissions of greenhouse gases, while meeting the world’s energy needs. Paper: Vanholme, R. Cesarino, I., Rataj, K., Xiao, Y., Sundin, L., Goeminne, G., Kim, H., Cross, J., Morreel, K., Araujo, P., Welsh, L., Haustraete, J., McClellan, C., Vanholme, B., Ralph, J., Simpson, G.G., Halpin, C., Boerjan, W. 2013. Caffeoyl Shikimate Esterase (CSE) Is an Enzyme in the Lignin Biosynthetic Pathway. Science Express. The University of Wisconsin-Madison is a public, land-grant institution located in Madison, Wisconsin. Recognised as one of America’s great universities in both achievement and prestige, UW-Madison offers a complete spectrum of liberal arts studies, professional programs and student activities. The university is the only academic institution to host one of the three US Department of Energy (DOE) Bioenergy Research Centers, which were funded to make transformational breakthroughs that will form the foundation of new cellulosic biofuels technology. The Great Lakes Bioenergy Research Center (GLBRC) is led by UW-Madison with Michigan State University as the major partner. GLBRC’s additional scientific partners include DOE National Laboratories, other universities and a biotechnology company. For more information, please visit www.glbrc.org.